Another beautiful styled shoot Paper Dolls participated in was this lovely, coastal charm inspired wedding. The rustic details are so stunning, the drift wood elements, the incredibly detailed table arrangements, the amazing cake, and our beautiful watercolor invites. This summer PaperDolls Design has been asked to participate in a quite a few beautiful wedding styled shoots! This shoot's stunning details and elements makes you feel as if you have just walked under the sea. From the beautiful sequin table clothes, to the subtle ocean details, the stunning ruffle cake and of course, our amazing stationery, everything fits so perfectly. The entire shoot was inspired by the colors teal, peach and coral. We added ombre stationery and watercolor coral to touch on that aquatic feel. This book is our journey together through my pregnancy with you. To my precious baby boy, I can’t wait to be your mama. From the day I found out I was pregnant with you, I’ve loved you more than you will ever know. You have been the most wonderful, easy-going baby throughout this pregnancy, not causing your mama any problems. I think this will be an indication of your personality, my sweet Aries. Taking care of you and teaching you all that I can sounds like the most rewarding thing I could possibly do with my life. I can’t wait until you meet your daddy! He’s the most wonderful man and I know he’s going to be such a great daddy to you. He may be stern with you at times, but always remember it is for your best interest and he loves you so. I completely trust him to take care of all of us for our whole lives. Welcome to this beautiful world and welcome to your family, sweet boy. Your dad and I can’t wait to meet you- you are our greatest blessing. We love you with our whole hearts. Oh Jackson David. How do I begin to tell you how much you mean to us-- “I love you” just doesn’t seem to be enough. We could have never imagined how much our lives would change when you entered our world. You made our hearts bigger and have filled them with so much love from the very start. Each day, we fall more in love with you. You have been the best baby we could have asked for, and we love to watch your personality develop each and every day. You bring such joy to our worlds with every smile and every laugh. You have made us a mama and a dada, and that means more to us than you'll ever know. You are our sunshine, our greatest adventure, and our dream come true. We will love you forever and always, our sweet son. This whole week is going to be all about my sweet baby boy who is turning O N E tomorrow!!! This year has definitely been the quickest yet, along with the happiest, hardest, and most rewarding year of my life :) As long as this little man will let me, I plan to pour my talents into every paper related thing that I can do for him!! His first birthday is no exception of course. Perhaps the most meaningful (although I'm sure each year is), but this is all I know for now :) For his first birthday, I decided (I knew this was most likely the only year that I will get any say) on a Little Brave Man pow wow theme. Of course I saw tons of adorable inspiration ideas on Pinterest that got the wheels turning, but its also a resemblance of his little personality :) He is a tough boy, and quite brave! I'm used to a dog that is literally scared of the sound of a blender and her worst nightmare is a vacuum cleaner. However with Jackson, he will crawl right up to the noisiest thing he can find, and confront it head on. He shows no fear, yet ;) He is our Little Brave Man. 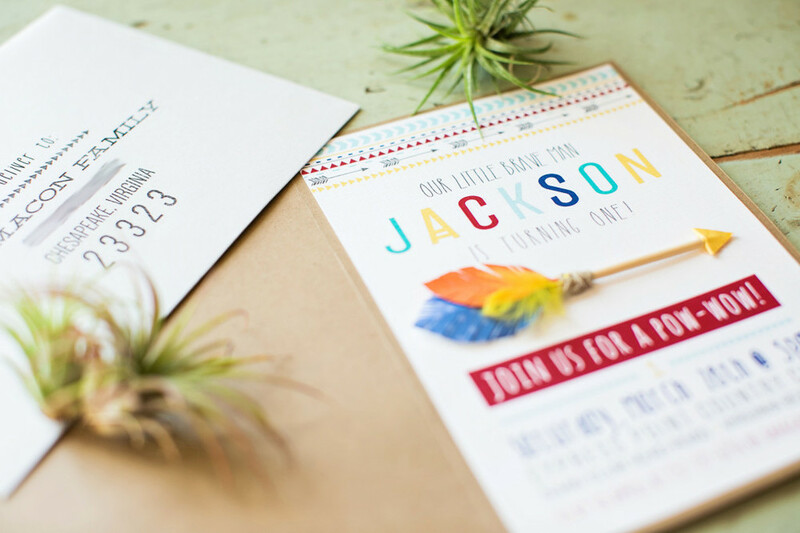 Enjoy these photos of his first birthday invitations from the oh so talented Macon Photography! Briana was sweet enough to capture these awesome images that truly brought the theme to life. We weren't able to get professional pictures of his birthday party, but I will still cherish them forever. In the meantime, you can find me sobbing in the corner as my sweet little baby celebrates his first year of life. I love you beyond words, my sunshine!! Determining the wording of your wedding invitations is sometimes the most difficult part of the invitation process. Many of our brides want to please everyone and want to ensure that they are following etiquette rules. Today we are going to discuss the various ways that you can word your invitations. In its simplest form: all you need to include is who is getting married, the date, time, and location, but there are many ways that you can organize this information. If the bride's parents are hosting, then it is customary to leave off the bride's last name. It is assumed that the bride shares the same last name as her parents. If, by chance, the bride has a different last name, then you use the bride's full name. While this is the traditional wording, many brides and grooms choose to do something different. The biggest question we receive is how to word the invitation when the bride & groom are hosting or if everyone is chipping in.